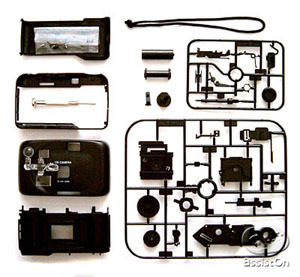 35mm Camera Snap-Together Kit | OhGizmo! By David Ponce on 11/14/05 • Leave a comment! As a kid, I used to make model cars from these plastic kits where you had to snap out all the parts and glue them together. Course, all the other kids in school would steal my glue and go explore… other realms. But glue was cheap and I took pride in what I did, so I bought some more and kept on trucking. These models, of course, were useless. Completely useless, unless you consider table ornaments useful. I wish I had then one of these very cool 35mm camera kits instead. For $9, you can spend some quality time re-exploring a hobby of your youth, and at the end be rewarded with a presumably functional 35mm camera, although apparently this thing doesn’t require glue. For a very fun Babelfish translation of the product page, go here. Story VIA BoingBoing.